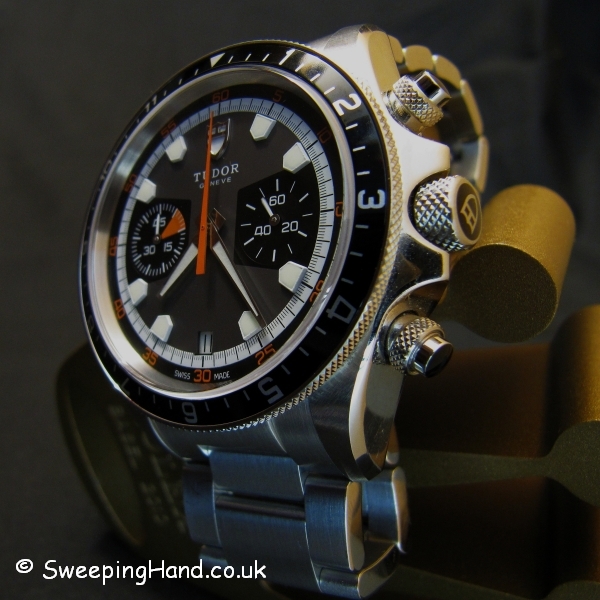 Here we have a Tudor Heritage Chronograph 70330 for sale. The Tudor Heritage Chronograph 70330 took the Basel World watch fair by complete storm in 2010 leaving all of its rivals new launches as also rans. 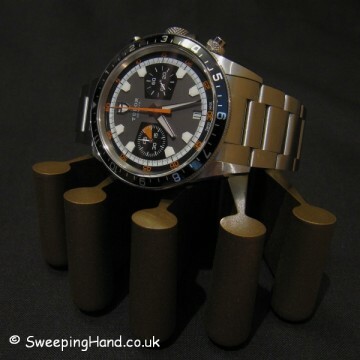 Easily the most talked about new watch that year. 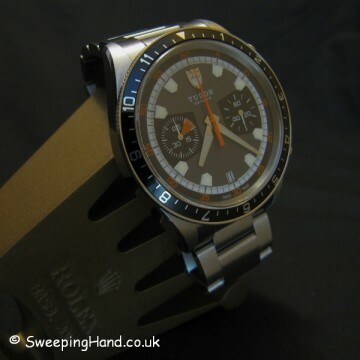 There are still very few in the UK, in relative terms, as there are no Tudor Authorised Dealers either here or in the USA anymore. That has kept the watch both in high demand and also rarely seen on anyone’s wrists on these shores. 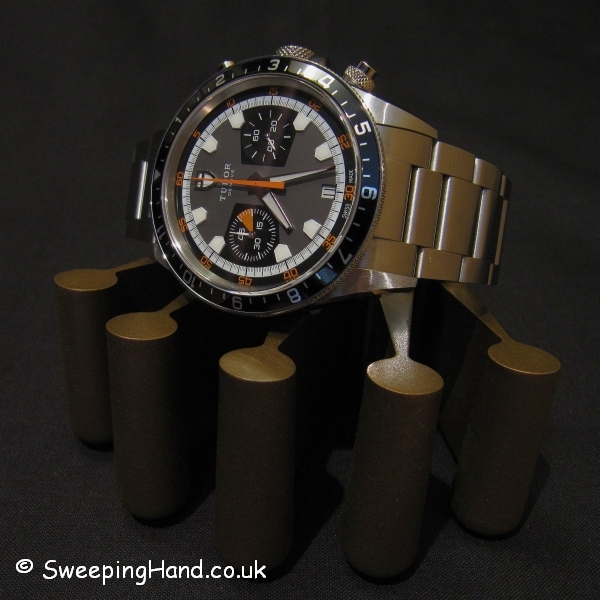 Those who have managed to secure one usually fall in love though….and its easy to see why. 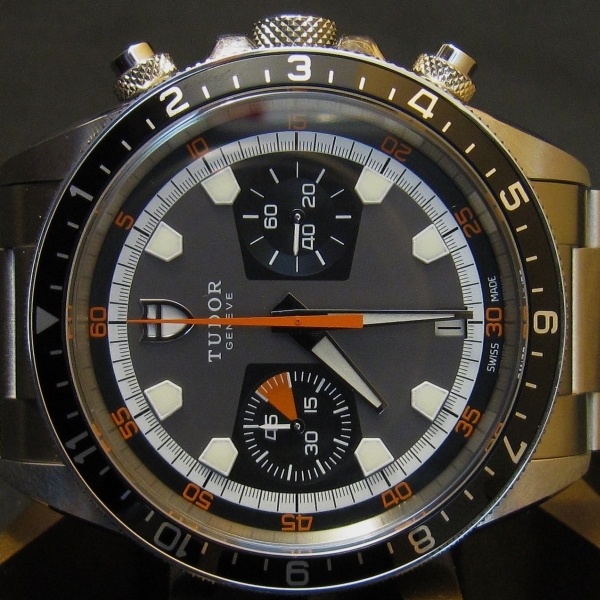 The Tudor Heritage is a homage back to the famed Tudor Chronograph Monte Carlo Homeplate of the early 70’s – Tudor’s holy grail watch. 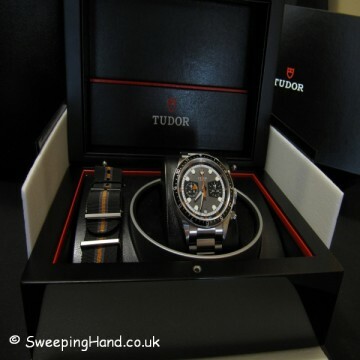 Its looks are both a mix of classic vintage Tudor with modern build quality and details. 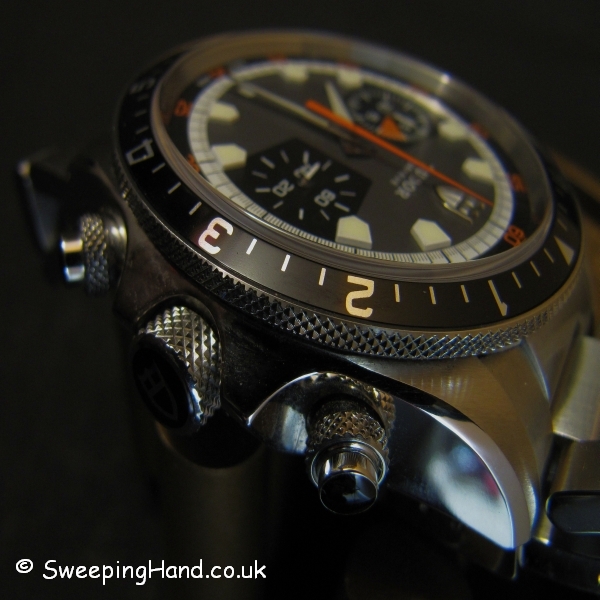 This is one modern watch that on your wrist screams cool! 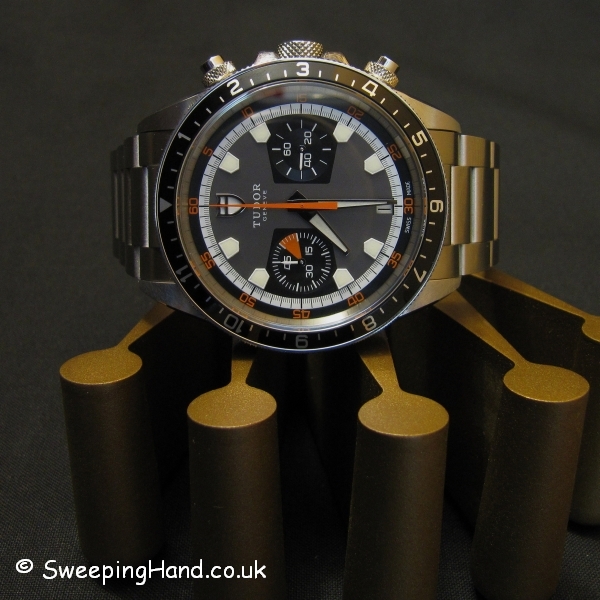 Dial & Hands: Stunning modern recreation of the 70’s Tudor Monte Carlo. 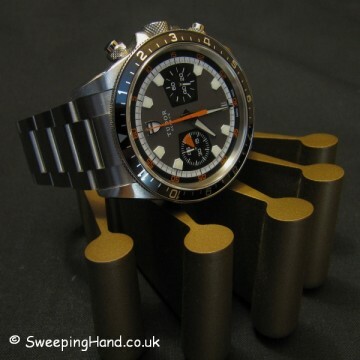 Three dimensional indices and contrasting two register chrono dials. Orange chronograph hand with outer ring matching orange numerals. Case & Caseback: Good size Tudor case of modern watch proportions with fantastic bezel and pusher detail. Bracelet: A completely new fliplock Tudor bracelet for this watch and it is both solid and secure in feel and design as befitting the rest of the watch build. In addition Tudor launched this with a nato strap that is included also and unworn. Movement: Original ETA 2894 movement that works perfectly and functions as it should. Box & Papers: Full inner and outer Tudor boxes, tags, booklets and Tudor guarantee cards as expected. 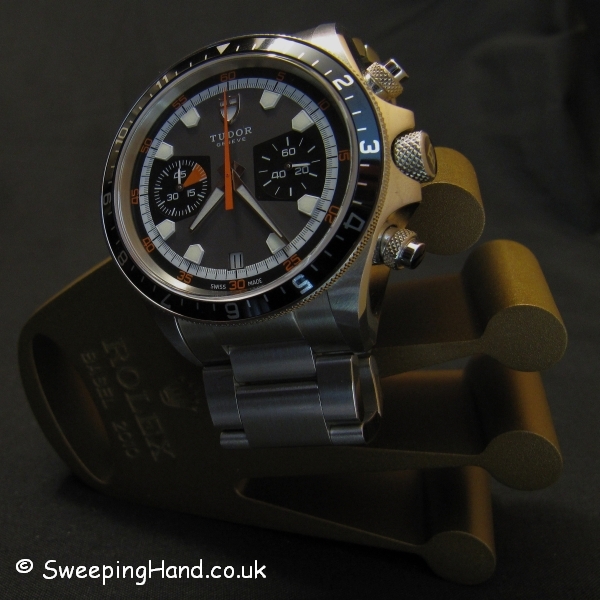 PreviousPrevious post:Ladies Rolex Oyster Perpetual For Sale 1972NextNext post:Welcome to the SweepingHand Blog! 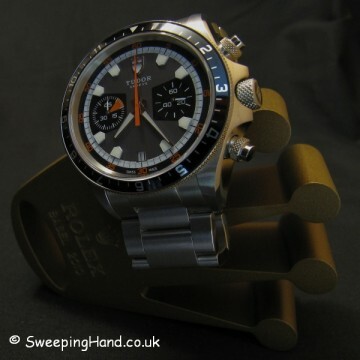 I wondered if you could let me know the size of the case diameter and also the case thickness for the Tudor Heritage Chrono you have, I love the design but am looking for something a little lighter and slimmer than my Breitling B01 Chronomat for wearing with shirt sleaves.